Using a baby high chair makes baby feeding time comfortable and safe. The contemporary wooden stacking baby high chair is of a solid robust design, can be supplied in either light or dark wood finishes, is stackable and space saving. 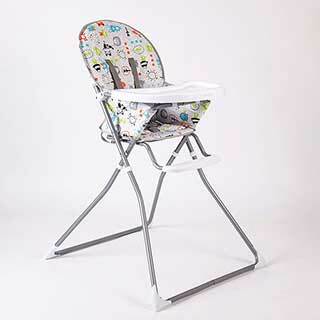 Our folding baby high chair is made from lightweight aluminium, has a 5 point adjustable safety harness, a wipe clean PVC seat and folds away neatly when not in use. All our baby high chairs comply with European safety standards. Order your baby high chair from www.supply2hotels.co.uk. Stackable hotel wooden high chair in natural wood finish. This durable rubberwood high chair is space saving and stackable. It complies to European safety standard BS EN 14988: 2006: Parts 1 and 2. Space saving stackable solid wood mainframe. Simple self-assembly. Stacks to save space. Sollid robust design. Supplied with adjustable waist strap harness. Simple contemporary design. This product is intended for children up to 36 months old, weighing a maximum of 15 kgs, who are able to sit up unaided. Incredible value for money. Push up to table design. Wipeable finish. Seat height: 520mm. Weight : 6kg. Stackable hotel wooden high chair in dark wood finish. This durable rubberwood dark wood finish high chair is space saving and stackable. It complies to European safety standard BS EN 14988: 2006: Parts 1 and 2. This deluxe padded high chair with a tangerine circles design is ideal for feeding baby once they are ready for weaning, the reclining back makes it extra comfy for the younger child, and has a 5 point harness for added safety. The Hauck Alpha Plus wooden high chair in natural wood has a seat and footrest which are adjustable in height and s so it can adapt as the child grows. The two restraining systems will help keep baby safe and comfortable at all times. Manufactured from sustainably managed European beech wood. Height 80 cm. Width 48 cm. Depth 56cm. W eight 5.2 Kg. The seat height is adjustable from 48 to 54 cm, with a tray height of 69 cm. Available in Natural only. This baby folding high chair in green and white is both comfortable and practical. The high chair has a padded seat for extra comfort. It has a wipe clean PVC seat. Suitable for babies from six months. For extra safety the high chair has a 5 point safety harness. For added comfort a footrest is provided. The large easy clean plastic tray can be used for either eating or playing.